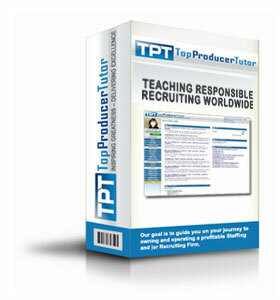 The Top Producer Tutor is Barb’s “brain dump.” This teaches an individual to become a responsible and successful recruiter. 85% of our students are experienced in the Staffing and Recruiting Profession but want to increase their production and success. 15% of our students are rookies that our program jump starts! There are three levels to this program Owner – Manager – Student. The Owner and Manager have a daily management guide and can view the actions, notes and test results of participants. Owners can add events and content to their library. In addition to the core program, each week individuals receive legal, sales and technology training to enhance their knowledge and skills. There are also over 300 recorded Webinars in the Library on hot topics. These programs can be watched or downloaded on an MP3 player if a person prefers to listen to the training. We are confident the Top Producer Tutor provides results by the positive feedback we’ve received from our 26,000+ students worldwide.